The music recorded here often appeared in the early days of historical performance practice when the rediscovery of ancient instruments allowed the performance of music from the renaissance. It was the time when ensembles entered the stage with a whole battery of extravagant-looking instruments producing new sounds. Much has changed since then; the pieces recorded here pop up from time to time in programmes of renaissance music but most ensembles now offer more substantial compositions. That is not to say that the music which Lucie Guerra Záková has selected is null and void. The title is correct in that what she plays - or at least most of the pieces - belongs to the 'popular' music of the renaissance. These pieces appeared in many different forms and were often recycled and arranged. They were included in sources of music which were purchased by music-lovers of the time - mostly from the upper echelons of society - to play at home or in social gatherings. Before the 17th century there was very little music specifically intended for instrumental performance, except that for lute or for keyboard. By and large instruments and instrumental ensembles mostly played either vocal music or dances. The programme of this disc reflects that. Tant que vivray was a very popular piece in the 16th century; originally a chanson for voices it was also played on instruments. The largest part of the programme comprises dances, such as bransle, gaillarde and basse danse, to mention just a few of the most popular. It is impossible to say exactly for which instruments these pieces were written. Dance music could be played on almost any combination, such as a consort of viols, a consort of instruments of different families or a single chordal instrument, such as the lute or the keyboard. Even when the title suggests a specific instrument a performance with other instruments is not excluded. An important source of instrumental music of the renaissance is the Buxheimer Orgelbuch. However, the reference to the organ does not imply that a performance with an organ is the only legitimate path. At the same time, a source like that indicates that the organ was not only used for liturgical music. It seems that especially small instruments - such as the portative and the somewhat larger positive - could be used for secular instrumental music. Here this kind of repertoire is performed on a large organ. It would be going too far to say that this is historically unfounded but it does result in performances which are not always fully satisfying. It seems that the acoustic of the church imposes restrictions on the tempi of some of the pieces. Now and then I found the tempi just too slow for instance the opening Intrada and also when it came to the Ronde et Saltarelle by Susato which ends the programme. It is tempting to add some effects to music like this and the outcome isn't always convincing. That is the case, for instance, with The Bells by William Byrd. It is one of the odd ones out as one can hardly call it 'popular'. It was written for harpsichord which is supposed to produce the effects the title refers to. Here these are highlighted by the use of church bells - and to top that the bells used are from another church. The music doesn't need that sort of treatment. There are other pieces which don't fit that well in this programme, such as the harpsichord works by Giles Farnaby and the Hexachord Fantasia by Sweelinck. The latter receives a performance which has little substance. This organ is probably too French in character to be ideally suited to a piece like that. The dances written or published by the likes of Gervais, Susato and Attaignant naturally come off best. The strangest piece is definitely the Juden Tanz by Hans Newsidler, a German lutenist. This was certainly written for lute but can be played on other instruments as well. The many dissonants and strange melodic twists make it sound like a piece from the 20th century. The performance profits from the temperament of this organ. It is a very important historical instrument, one of the very few French organs of the 17th century which have remained virtually unscathed. The pitch is a=396Hz, the tuning 1/5 comma meantone. The booklet is a little disappointing. There is much about the motivation behind this recording and about the organ and the performer but nothing about the music. The lack of identified sources is also a major flaw as many titles are so common that they are hardly identifiable. My critical remarks should not hold you back from purchasing this disc. 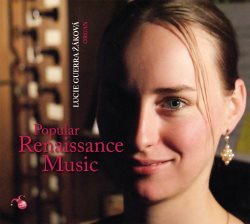 The music is enjoyable and Lucie Guerra Záková delivers fine performances; I especially like her ornamentation. The inclusion of percussion is a matter of taste but mostly within the range of what is stylistically feasible. The organ produces a sumptuous sound and its quality is enough reason to consider this recording.